The technique is simple: I used a recipe just to get the quantities correct, referring to Well-Preserved by Eugenia Bone. 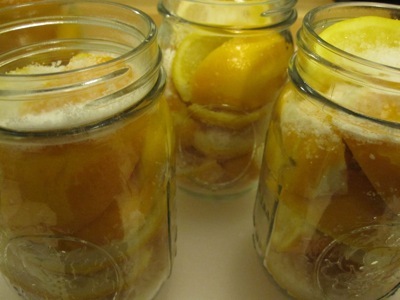 I started with twenty-four Meyer lemons, a cup of kosher salt, and four wide-mouth pint jars. I sterilized the jars in a pot of boiling water for ten minutes. 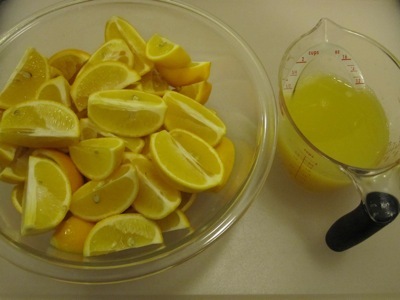 While the jars boiled, I trimmed the stem end off twelve lemons, then sliced them into quarters from pole to pole. I juiced the other dozen lemons. I drained the water out of the jars and let them air dry for a minute. 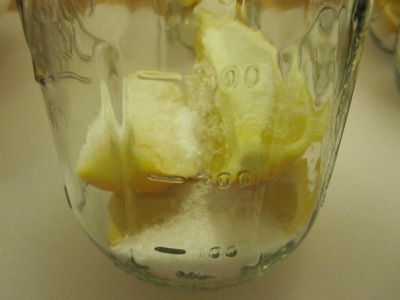 I added half a tablespoon of salt to the bottom of each jar, then packed in four lemon wedges, followed by a tablespoon of salt. I repeated the process twice more, ending up with twelve wedges in each jar, and three and a half tablespoons of salt, which I distributed by shaking the jars. I topped each jar off with a final half tablespoon of salt. I poured the juice into each jar, making sure the lemons were covered. I pushed down on the wedges a bit to compress them and squeeze out any trapped air. I set the lids (which had been simmering in water to soften the seals) on the jars and screwed on the band until they were finger tight. The jars will sit on a shelf in the kitchen for two weeks, with me inverting them every other day to keep the salt distributed, until they are fermented. After that, they will keep in my fridge for up to six months. As if they’ll last that long. From start to finish, including cleanup, this recipe took less than an hour. 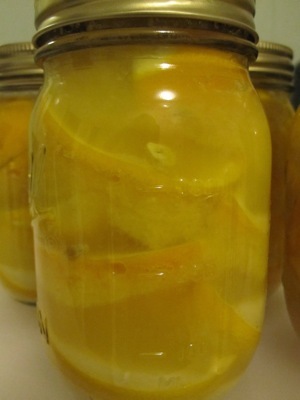 I encourage you to try it yourself, but do it now if you want preserved Meyer lemons. 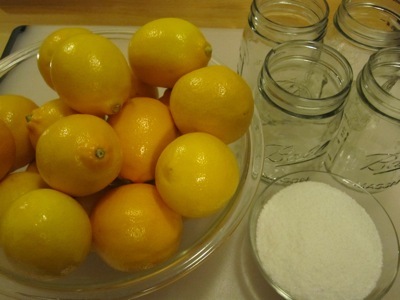 You can substitute regular lemons, but you’ll need more of them to produce enough juice to fill the jars. Go. Do it now. You’ll thank me later.